Mark Hyman | After the Diagnosis, Then What? Do YOU Need a Pediatrician? Over the holidays I spent time with some friends and their grandchildren. Two little boys, one a year old, and the other three, struck me as unusually healthy, vigorous, and happy when compared to the other whiny, pale, runny-nosed picky eaters at the dinner table. I later learned that both were born at home, neither had ever seen a doctor or been vaccinated, and that both chow down the organic broccoli, carrots and squash that their parents grow in their urban gardens. Just a coincidence or can we assume a cause-and-effect relationship? Almost every day, I receive a request for the names of pediatricians who are flexible about vaccinations. The abundance of demands is in reverse proportion to the paucity of doctors who are willing to consider each child’s individual needs. When I told a friend about these amazing kids, her response was “disgusting!” Her fully vaccinated grandkids have each had several serious bouts of croup, unexplained viruses and several hospital visits, “Why is it disgusting?” I asked. “They need a doctor,” she replied. “Why?” I asked. “They just do,” she replied. Hum… Do they? In my 2006 article on how changes in society and medical practices have contributed to the autism epidemic, I cite, among other factors, the over-dependence on antibiotics, vaccines, insurance-covered managed care, and fast food. If families choose “old-fashioned” immune-boosting solutions such as homeopathy, fruits and vegetables, along with a clean lifestyle replete with long, uninterrupted sleep, movement and love, is that sufficient? When I was growing up, my college educated parents knew a great deal about art, literature and history, and little about medicine or how the body works. In the fifties, Dr. Spock was the only available resource for distraught parents whose baby had a rash or fever, cried inconsolably, or didn’t sleep. We depended upon our personal pediatricians to help us when Dr. Spock’s advice failed to alleviate suffering. 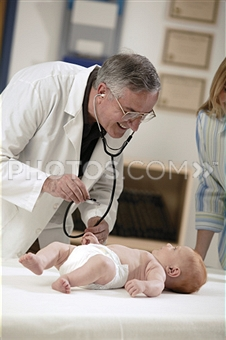 Today, few have a pediatrician who even knows their name. At the same time, newsletters and TV shows bombard us daily as Drs. Oz, Mercola, Gupta, Hyman and other experts on health and well-being educate us about eating our greens, ingesting essential fats, moving daily, and other dietary, nutritional and lifestyle issues. Many parents I know, including those of the robust little boys I observed, have made the conscious decision to boost their children’s immune systems with minimal medicalization and good food, and to trust the body’s wisdom to heal itself. They minimize stress from environmental toxins, inappropriate demands, and lifestyle choices. They recognize the detoxification role of fevers and rashes, and the early signs of chronic immune dysfunction: food allergies, raw or bumpy skin, and “colds,” and treat them naturally. Their libraries hold books like medical heretic Dr. Robert Mendelsohn’s, How to Raise a Healthy Child in Spite of Your Doctor, Smart Medicine for a Healthier Child, by Zand, Rountree and Walton, Dr. Randall Neustaedter’s Holistic Baby Guide: Alternative Care for Common Health Problems and Dr. Aviva Romm’s Naturally Healthy Babies and Children: A Commonsense Guide to Herbal Remedies, Nutrition, and Health. These great references advise parents on home treatments for routine childhood illnesses, allergies, and fevers, with clear-cut instructions for determining when a child needs medical intervention. They are my favorite baby shower gifts. Healthy eating and other immune-boosting choices are the way informed parents assure good health. Just like they choose to fix a drippy faucet themselves, but call a plumber when the basement is flooded, they are also smart enough to recognize when they need expert medical help. Then they could always go to the nearest “urgent care center,” a brilliant modern convenience. Think hard before caving in to fear-mongering about disease and childhood illnesses. Do you really need a pediatrician for a “well-baby” check-up consisting of a weigh-in and vaccination lecture, or can you trust your intuition that your child is thriving? The wise pediatrician who trusts the wisdom of the body is going the way of the local department store, as documented on a recent Sunday morning news show. Gimbel’s, Higbees, Rich’s, Horne’s, Marshall Fields are all gone! Only Macy’s survives. If you feel you still need a pediatrician, try to find one who supports health instead of treats illness. If your child is healthy, AND you are following healthy lifestyle, AND you know the signs of a medical emergency, ask yourself if YOU need a pediatrician. Maybe you don’t!